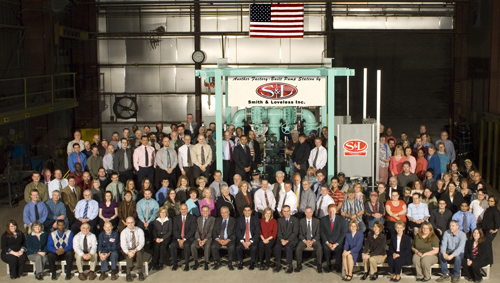 S&L History | Smith & Loveless Inc.
S&L's proud, 70-years in the water industry. B. Alden Smith and Compere Loveless founded Smith & Loveless Inc. in 1946 as a sales engineering firm representing several manufacturers in the wastewater industry. Early in their association, Smith & Loveless recognized the opportunity for complete, factory-assembled pump stations. Their first three stations were built for the City of Salina, Kansas. These units were fabricated in a converted barn less than three miles from the present world headquarters location. As demand grew, Smith & Loveless built their first manufacturing plant – a modest structure a few miles from the present plant site. Sales increased rapidly in the 1950s, and within a short time, Smith & Loveless maintained distribution throughout the United States and Canada. Because of this rapid growth, it was necessary to expand the manufacturing plant five times in a four-year period. Smith & Loveless moved its present world headquarters and primary manufacturing facility to Lenexa, Kan., a Kansas City suburb in 1958. The present plant, which itself has been expanded several times, covers more than 100,000 square feet of manufacturing and office space. In 1959, Smith & Loveless was acquired by conglomerate Union Tank Car of Lincolnshire, Ill (later known as Trans Union). While the acquisition complemented markets served by other divisions of that firm, it marked a period when additional capital for expansion and research and development ensured Smith & Loveless’ leadership in the wastewater industry. Following a 1981 Trans Union merger with the Marmon Group, the executive management of Smith & Loveless engineered a management buyout by purchasing the company’s assets. Reborn as Smith & Loveless Inc., the newly privately held company renewed its commitment to maintain its role as a leader in the water industry. Its strategy was simple: design and manufacture quality equipment and provide superior service. In the 1980s, expansion strengthened the company’s leadership position. In 1984, Smith & Loveless, purchased two firms: SCIENCO®, Inc., St. Louis, Missouri, and DI-SEP® Systems International, Inc., of Santa Fe Springs, California. In 1985, Smith & Loveless added another subsidiary by acquiring St. Louis Marine Systems, Inc., and renamed it FAST® Systems, Inc. Later, Smith & Loveless’ St. Louis operations were merged into SCIENCO/FAST® Systems while still serving their diverse markets. In 1987, Smith & Loveless made another step to provide additional capabilities in water treatment by acquiring K-W Industries of Omaha, Nebraska, and absorbing its product line. In a move to both broaden Smith & Loveless Inc.’s water product line and expand into the European marketplace, Smith & Loveless Limited, an affiliated company of Smith & Loveless, Inc., acquired the majority interest in Kalsep Limited of Camberley, England on March 29, 1995. Licenses granted allow Smith & Loveless products to be sold by Kalsep Limited and Kalsep Limited’s water products to be sold in Smith & Loveless’ markets. Further international expansion occurred in the late 1990s when Smith & Loveless New Zealand Ltd. obtained licenses to market and sell Smith & Loveless Inc. technology and equipment in New Zealand and Australia. In 1999, Smith & Loveless Limited – UK began to more actively market and sell Smith & Loveless, Inc. technology in the UK. On the domestic front, Smith & Loveless Georgia Inc. was formed in 2000. This allows the Company to provide superior pump station sales and service for its Georgia customers. Ever growing and advancing, Smith & Loveless purchased the assets of the BIOMIXER Corporation of California in 2003 to obtain innovative aeration and mixing technology. Then, in 2015, S&L acquired SCHLOSS Enineered Equipment, of Aurora, Colo. The move further enhances S&L's full line of headworks and wastewater treatment equipment.